As the seasons change and parents reach for over-the-counter (OTC) cold medicine for their icky-feeling children, they may be baffled by the new instructions: Do not give them to children under 4. 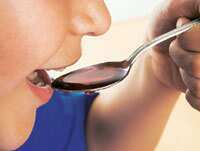 Drug companies in the US recently announced that they are voluntarily changing the labels for OTC cold and cough medicines, in a nod to paediatricians arguing they do little good and aren’t worth the risks. Brad Weselman of Kids Health First Pediatric Alliance says: “We know parents want to give their kids something when they are miserable. But the benefits don’t balance the side effects." Some medications can make children excessively groggy, making it difficult for them to concentrate in school, he says. Others, he adds, can leave a child “wired" and increase the heart rate. Instead, Dr Weselman suggests treating children with saline drops, warm apple juice and gargling with salt water. The new labels are being brought in after a study found that at least 7,000 children are rushed to emergency rooms every year because of adverse reactions to OTC cough and cold medicines. Most cases are of children overdosing when parents aren’t around, according to the study published in the April issue of Pediatrics—the journal of the American Academy of Pediatrics. Meanwhile, the US food and drug administration (FDA) has already recommended OTC remedies not be used for children under 2, and is studying effectiveness in children under 12 to decide whether to restrict further. The FDA has also expressed support for the Consumer Healthcare Products Association’s move to voluntarily change the labels to discourage use for children under 4. Doctors say parents often run into trouble when they give their child multiple medications. For example, a parent may give a child a multi-symptom cold medicine as well as Tylenol, not realizing they are essentially administering a double dose of acetaminophen, also called paracetamol (brand names, Crocin and Calpol in India). Still, doctors say the latest change doesn’t mean you have to take paracetamol and ibuprofen off the table (in India, Combiflam includes both paracetamol and ibuprofen). Doctors say they are still an approved, fever-reducing measure and considered safe—as long as they are administered appropriately. Rothman says she turns to several natural remedies to combat colds, including liquid vitamin C, vitamin-rich kiwi fruit, extra rest and saline drops. But she also keeps OTC medicines at hand. “I don’t think it’s an abuse to have them," she says. “I think it’s good to have (OTC medicines) when you have a child with a really bad cough, and you don’t want it to get worse." She keeps laminated information about proper dosage of medicine for children in her pantry. Her family keeps a log any time her child is given any medication. Still, she says, the change in labels and questions about OTC medications have given her pause. She will now “think twice and use less".